This is a Yantra for Desire Fulfillment. This Yantra is either the same as or a variation of the 15 Che Yantra; a famous and powerful Yantra, given in the Marathi scriptures; which total to the number 15 when counted from every direction. 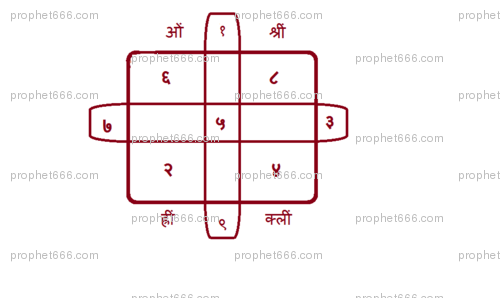 It is also known in Hindi as the Gauri Shankar Yantra and is known to aid in the fulfillment of all desires of the material nature; including money, property and owning luxury items. It has to be prepared either on a Monday or Tuesday on a Bhojpatra using the paste of Rakta Chandana [red sandalwood] and written with a wooden pointed writing instrument. Then it is energized by offering it Agatbatti, Diya of Ghee and scented flowers for 3 days. is this for 1 purpose or many purposes? Do we have to make this type of diagram on the bhojpatra? Neck is better if you are a woman, any colour thread can be used. What can I use becuase it is hard for me to find Bhojpatra. Bhojpatr pansari ki shop main easily available hote hain..sabhi pooja aur hawan saamgri pansari ki shop se mil jaati hai...agar aap delhi main hain to easily available in central market..
To energize this yantra should the Diya & agarbatti be continuously enlighten or one piece everyday? Kindly guide me with your priceless guidance. It has to be energised 3 days in row 1 piece everyday. kya hum number english me likh sakte hain jaise ,6,8,10 ya hindi me hi numbers likhane hain?? Yes, you can write the number in the English language. can it be wrapped in a bhojpatra or a white paper with kalawa as a makeshift locket? You can use a makeshift locket for keeping the Yantra. One question. Being a female, if we wear this yantra in neck then do we need to remove in the 4days of periods or its Ok to wear in those 4 days also? That is not necessary, once you wear the Yantra on the neck. Can we keep it in our purse or shirts pocket? ?